Thank you Barefoot Wine for sponsoring this post! I made a from scratch chocolate cake. And it’s so good. I’ve teamed up with Barefoot Wine to bring you delicious, budget friendly recipes that are easy to make. 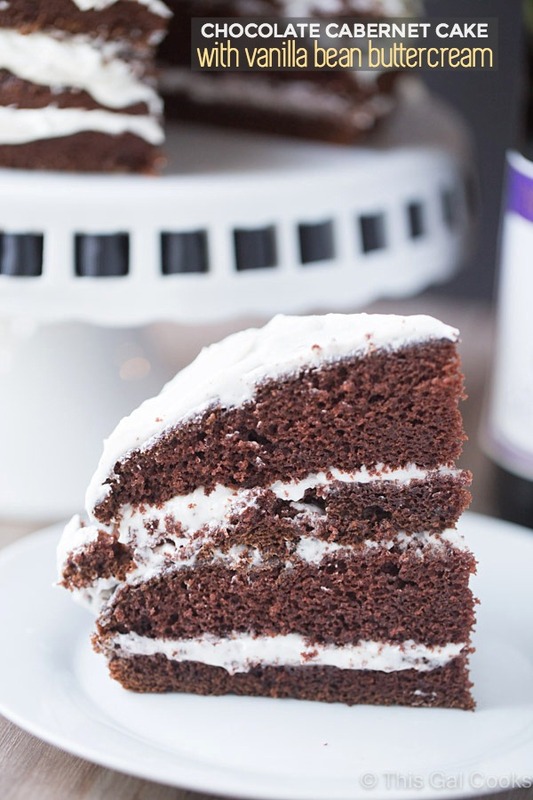 Today I’m sharing this Chocolate Cabernet Cake with Vanilla Bean Buttercream. What’s the not so secret ingredient in this cake? Barefoot Cabernet Sauvignon. The Cabernet really boosts the chocolate flavor in this cake. And if you’re a chocoholic like me, that’s a very VERY good thing. You may be hesitant to bake a cake from scratch but it’s actually really easy to do. I used to be afraid to do it. In fact, I refused to do it. Every from scratch cake I attempted sunk in the middle. This caused me to grab a boxed mix whenever I wanted to make a cake. But then I made this Pumpkin Spice Cake from scratch and it came out perfect! My fears of from scratch cakes were over and now I almost always make cakes from scratch. After doing extensive cake baking research, I found out that a few simple tricks would assist in baking a perfect from scratch cake. Always sift the flour before measuring it. Make sure your eggs and butter are room temperature before beginning the mixing process. And NEVER open the oven while the cake is baking. It’s tempting but don’t do it. After your cake is done baking, allow it to cool completely before removing it from the pan. If you remove it while it’s still hot, it may fall apart. 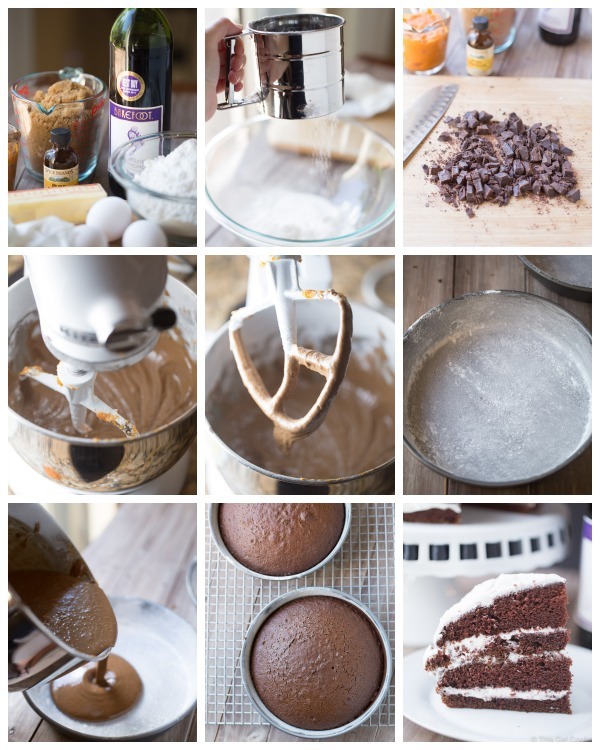 So do you want to find out how to make this simple chocolate cake? Here are a few process photos. Then we’ll get to the instructions. Enjoy the recipe! Find the printable Simple Vanilla Bean Buttercream Frosting recipe here. Preheat your oven to 350. Grease and lightly flour 2 9 inch round cake pans. Add the unsweetened chocolate to a small sauce pan and heat over low heat. Stir often until melted. Turn off the stove but leave on the burner to keep warm. Stir occasionally. In the bowl of a stand mixer using the flat attachment, beat the butter until smooth. Add the eggs and brown sugar and meat until fluffy, about 5 minutes. Add the vanilla extract and melted chocolate and beat on the lowest setting until combined. Once combined, mix in the salt and baking soda. Add the flour and pumpkin puree alternatively, mixing on low until combined. Bring the water and the Cabernet Sauvignon to a boil. Pour into the cake batter and mix with a spoon until well incorporated. Pour equal amounts of the batter into the prepared cake pans. Bake at 350 for 30 minutes or until a toothpick comes out clean. Allow the cakes to cool completely. Once cooled, remove from the pans and slice each cake horizontally, into equal parts. If they aren't equal, it's fine. As you can see, my layers weren't exactly the same thickness. 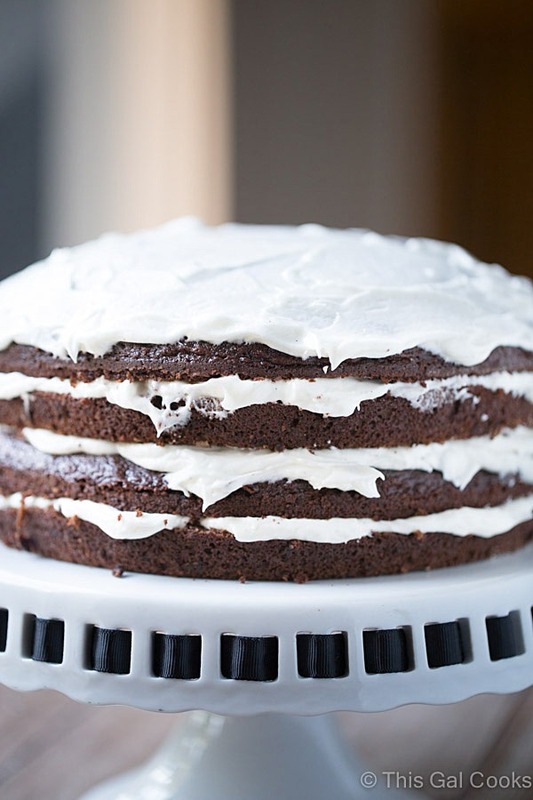 Place one layer on a cake plate and top with some of the frosting. Repeat this process until all layers are assembled and frosted. Is it too early have a slice of this cake? 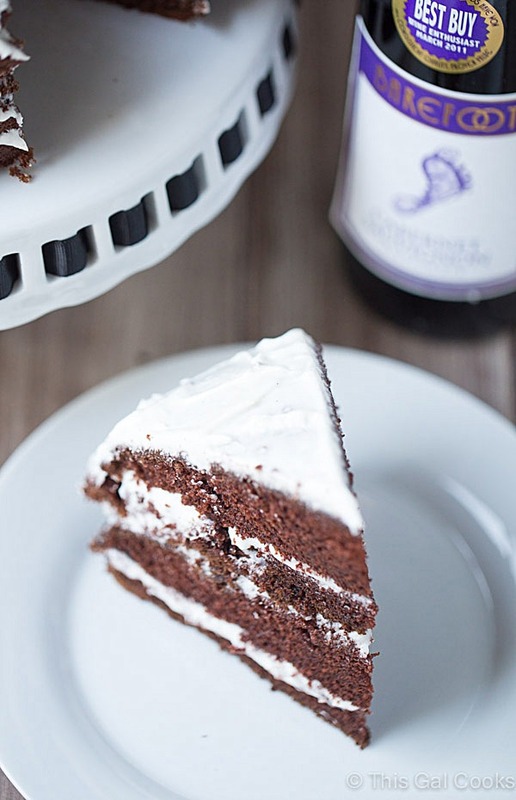 Wine in cake is the best idea, ever! I’ll take a slice, please! This cake is soooo pretty, Julie! I love it. I made a chocolate cake with Zinfandel once and it was great. This sounds fantastic! I really love Barefoot wines – my uncle does too and we usually exchange a few bottles for Christmas. It’s just a perfect, affordable brand as a ‘house wine’, so to speak. Thanks for sharing this recipe! It was a first for me, too, Shashi! So glad I tried it. It was perfect in this cake! This cake looks absolutely incredible, and I’m amazed it’s got wine in it. Thanks for the cake-making tips, too. I was blissfully unaware of pretty much all of those things! I think if you keep practicing, you will start making some good cakes, Helen! 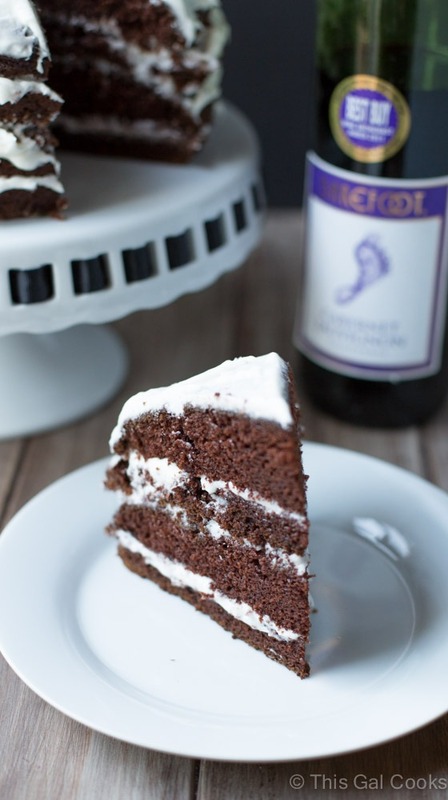 The wine brings out the chocolate flavor in this cake. Which is great. You can’t go wrong when boosting the chocolate flavor! Oh man, cake and wine together?! This has to be the best cake ever! I used to be afraid of layer cakes too. But for me it’s more how to frost them. I love the naked cakes! This looks divine Julie, I bet the chocolate is really pronounced thanks to the wine! Thank you, Tanya! I love the naked cakes, too! My fav and to me, they look prettier, too! This cake looks so delicious! I bet the red wine adds so much flavor to the cake. Red wine and chocolate go great together. The red wine does add a lot of flavor to the cake, Alyssa! 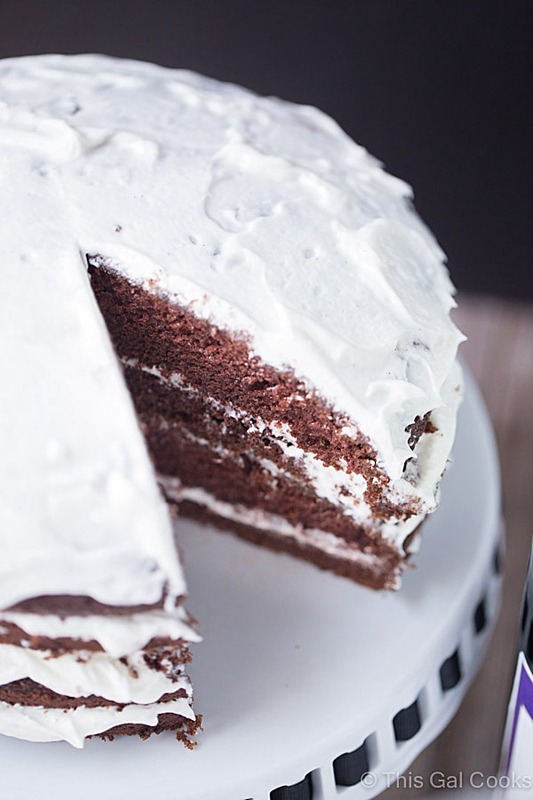 It really boosts the chocolate flavor and makes the cake so tender and moist. Thank you for stopping by and for the compliment, too! You had me at Cabernet! And chocolate! Also, those pictures are practically edible themselves. Nice. Wine in cake. It’s my BFF! :) Love this.